Great HIIT Elliptical Workouts that Get Results! When most people think about High Intensity Interval Training (or HIIT) workouts, they often associate them with the treadmill, bike or outdoor sprinting. But what about a HIIT elliptical workout? Take your elliptical workouts to the next level by including HIIT. The elliptical is a great choice when it comes to getting in your interval sessions and offers a few benefits that the other options don’t. The elliptical allows your body to emulate a running motion without causing the strenuous impact on your joints that occurs on a treadmill. Most elliptical trainers are equipped with movable handles which allow you to exercise your upper body and lower body simultaneously. This helps with the intensity of your HIIT elliptical workout. Most ellipticals allow you to stride in reverse which can activate different muscle groups and put more emphasis on your quads and offer an adjustable variety mid-workout. Power-incline ellipticals can also work different muscle groups for increased effectiveness. Studies show that people are actually working harder than they perceive when exercising on an elliptical. Subjects in the studies were asked to rate their perceived output when exercising on an elliptical. The majority of research showed subjects underestimating actual output based on their heart rate. Therefore, the elliptical can burn close to the same amount of calories with less effort. While HIIT sessions may not be appropriate for all fitness levels, you can work your way up to being able to incorporate them a couple of times a week into your training routine. I generally suggest that one should be able to complete at least 30 minutes of low to moderate intensity cardio activity such as jogging, biking or using an elliptical before adding in HIIT workouts. Once you’re ready to try HIIT, you need to have a general idea of the maximum level you can push yourself. 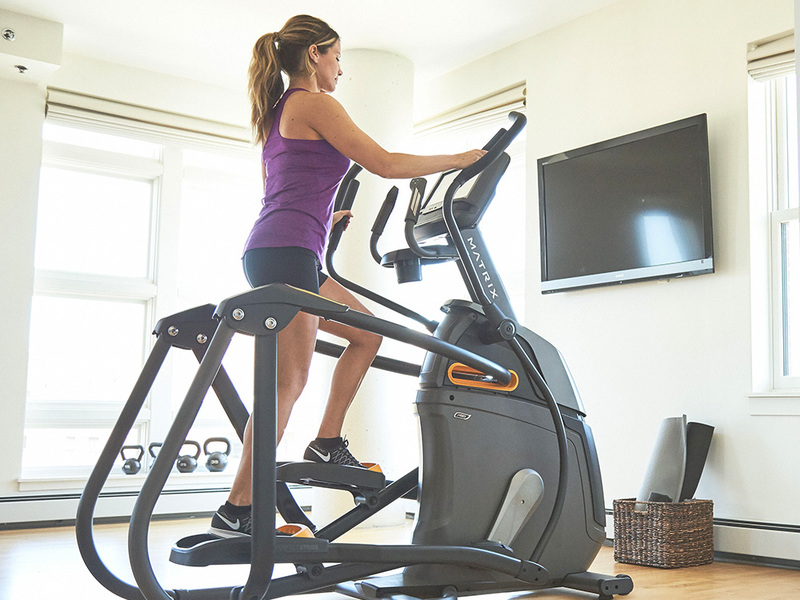 The elliptical offers differing variables from that of a treadmill. You can increase the resistance level of the pedals on the elliptical, while on the treadmill you’re only changing the speed and/or incline. On the elliptical, you may want to build your intervals based on the resistance level and/or incline and increase it on your “work” periods and decrease it on your “recovery” periods. Also, here are a couple of ideas on what a typical HIIT elliptical workout might look like. Keep in mind, one of the great parts about HIIT training is that you can design your own intervals based on your fitness level. Always begin with at least a 5 minute warm up before getting into the heart of the intervals (usually 12-20 minutes). Then cool down for another 5 minutes or so at a low to moderate pace after your workout. Use both resistance and incline on your elliptical for best results. Certainly give HIIT on an Elliptical a shot and see for yourself how this type of training can give your workouts – and results – a big boost!